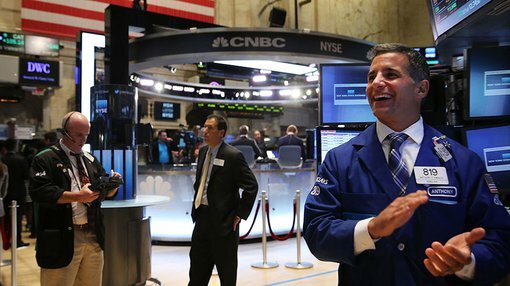 US markets finished what could best be described as a volatile week on a positive note with the Dow gaining nearly 1% and the index once again pushing above the 20,000 mark to close at 20,071 points. The strong performance was largely driven by the financial sector which rallied on the back of another quick-fire executive order from President Trump instructing the Treasury secretary to review post-GFC legislation which could see a rollback of industry regulations that most analysts view would translate into a profitable outcome for banks and most other financial institutions. Morgan Stanley led the way with a gain of more than 6% and there were also strong performances from JP Morgan Chase (+3%) Citigroup Inc (+3.2%) and Goldman Sachs (+4.5%). It should be noted that historical data in terms of earnings performance and/or share trading patterns should not be used as the basis for an investment as they may or may not be replicated. Those considering stocks in these markets should seek independent financial advice. While there was positive sentiment across most sectors, the heavy index weighting of the financial sector contributed to the size of the overall rally. Tech stocks were also well supported with the NASDAQ index closing at an all-time high of 5666 points. While important economic data was released on the day in the form of January Non-Farm Payrolls, the news was mixed and there wasn’t a significant degree of variance outside consensus that would likely impact markets. Furthermore, while jobs data was positive, wages growth disappointed, a combination of factors that tended to contribute to the Federal Reserve taking a conservative approach to raising rates in 2016. Positive sentiment in the US rubbed off on the UK and mainland Europe with the FTSE 100 gaining 47 points to close at 7188 points, representing a gain of 0.6%. The DAX and the Paris CAC 40 were up 0.2% and 0.6% respectively. On the commodities front, oil continued to trade in a tight range between US$53 per barrel and US$54 per barrel. Despite positive market sentiment there was still support for gold as it pushed above US$1220 per ounce. Iron ore was off slightly, and with China’s central bank raising key interest rates in the money market on Friday there is the potential for further weakness. This was reflected in significant declines across all base metals which translated into some steep share price falls amongst global miners. The Australian dollar continued to strengthen against the US dollar, pushing up towards US$0.77 before closing at US$0.768, a gain of approximately 0.3%. As well as overseas developments, investors will be keeping a close eye on domestic data on Monday as retail sales figures are released. The S&P/ASX 200 consumer discretionary sector has been sold down heavily over the last month falling from 2170 points to Friday’s close of 2042 points, a level that is now more than 200 points shy of its 12-month high. Most analysts are tipping a fairly shaky earnings season for retail stocks with only a few sectors seen as resilient in the face of what was a challenging Christmas sales period. Companies exposed to the home furniture and entertainment sector have had some support with the likes of JB Hi-Fi and Nick Scali seen as having the potential to outperform.